That's it! I finished the last bit of work on a Vassal Mechanik tonight and I now have a playable 35pt. pKreoss list. I'm really excited to have the whole thing painted, based, and ready for action. I have a ton more to paint, but I also have everything assembled that I own assembled, with the exception of the Fire of Salvation conversion I'm working on. I chose pKreoss because he is a fairly straightforward warcaster to play with. His spells cover a wide variety of situations, both providing potent offensive spells and some excellent upkeeps as well. Defender's Ward has to be one of the nastiest spells out there right now in terms of making already scary warjacks (Avatar) even scarier. That said, his feat is also very straightforward. On his feat turn, he knocks down all enemy models in his control area (unless they are immune to knockdown, that is). Simple. So, here is the list I have concocted using the models I have completed. Honestly, I think this list is a bit too reliant on the warjacks, but this is what I have painted. 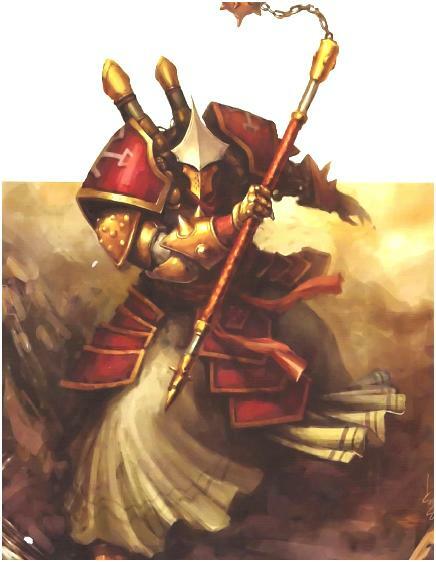 Honestly, I think an improvement would be to drop the avatar for a unit of Knights Exemplar as second wave counter-attackers and possibly a cheap light warjack like a revenger to give pKreoss some added threat range. That said though, I think it has enough threats and support to make it quite nasty and it accomplishes this in a fairly focus efficient manner. The Avatar and Wracks go a long way in helping stretch pKreoss' focus pool. If I have too hard a time of it, I do have a backup list with pSeverius. It replaces the Crusader with a Revenger and Repenter, min choir and no wracks or Mechanik. So please, send me some feedback. Do you think a beginner with this list stands a chance of putting up a fight? Is it a good learning list? I know there are glaring weaknesses, but I don't currently have the painted models to remedy it. Thanks! Interested in this series? Be sure to comment on what you read and stay up to date by Subscribing to Gone to Ground for more articles. I've only played trollbloods and cygnar and maybe around thirty games so standard caveats apply. As someone who is also painting up my PoMs to get on the table I would say this is a good learning list. Have you played any games yet? If not I'd scale back the points to 15 or 25. I also would suggest dropping the crusader and mechanik and minimizing the choir. The Vanquisher I'm guessing is good all the time and definitely good on the pop n drop. Squeeze the Covenant and hierophant in somewhere also. Maybe Vilmon and a paladin or two as bodyguards. After posting is when I saw the list of PoM you have collected but not painted. That's how observant I am! Get painting! You are a really good painter!